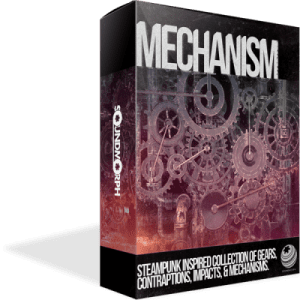 Steampunk inspired Collection – Mechanism is a collection of Steampunk inspired gears, contraptions, metal, servos, and of course mechanisms. Created in collaboration with Sweet Justice Sound, Richard Devine, and SoundMorph, we spent time to ensure quality and usefulness with this unique collection. Half designed and Half source recordings, Mechanism gives you a toolbox to be inspired by.